Chicago Public Library celebrated National Summer Learning Day with more than 300 children participating in learning activities and a story time with illustrator Bryan Collier, the National Summer Learning Association’s (NSLA) 2018 Summer Learning Ambassador. Each child also received a copy of Collier’s award-winning illustrated book Trombone Shorty, written by Troy “Trombone Shorty” Andrews, and toys donated by Hilco Global and Cradles to Crayons. Children in attendance were treated with a special story time with Collier, accompanied by live a live jazz trombonist. Each child in attendance received a free copy of Trombone Shorty courtesy of Clear Channel Outdoor, the media partner of NSLA. 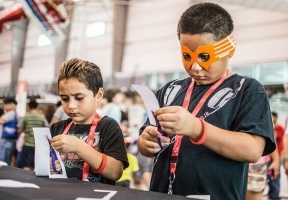 Over 300 children in attendance participated in a series of hands-on learning activities, courtesy of the Library’s 2018 Rahm’s Readers Summer Learning Challenge partners, including the Museum of Science and Industry, the Chicago Public Library Foundation and funders, The Art Institute of Chicago, Shedd Aquarium, and Chicago Public Schools. 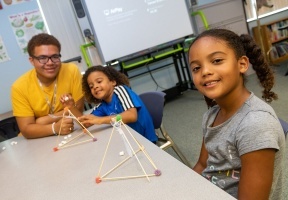 National Summer Learning Day highlights the importance of kids continuing to learn and stay active during the summer, and to combat the “summer slide” where children can lose up to three months of math and science learning if they do not remain engaged in learning. Rahm’s Readers Summer Learning Challenge runs through September 1. To find out more about the Summer Learning Challenge, visit chipublib.org/summer.